GENERIC NAME(S): Collagenase Clostridium Histo. This product is used to help the healing of burns and skin ulcers. Collagenase is an enzyme. It works by helping to break up and remove dead skin and tissue. This effect may also help antibiotics to work better and speed up your body's natural healing process. This medication is for use on the skin only. It is usually applied once daily or as directed by your doctor. If the dressing becomes soiled, collagenase may be applied more frequently. To apply, wash hands first. Clean the area as directed by your doctor. Cleaning solutions such as hydrogen peroxide, normal saline, or Dakin's solution may be used. If your doctor has directed you to use an antibiotic powder, apply it first before applying this medication. Use a wooden spatula or a gauze pad to carefully apply the collagenase ointment directly to the affected area. Bandage securely. If you are unclear about how to clean the affected area or apply this medication, consult your doctor. Avoid applying near the eyes. Be careful to apply the ointment only within the affected area. Wash hands thoroughly after applying the ointment. 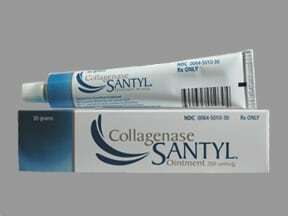 What conditions does Santyl Ointment treat? Pain or a burning feeling at the affected area may occur. Temporary redness/irritation may also occur in the skin around the affected area. If any of these effects persist or worsen, tell your doctor or pharmacist promptly. To avoid redness/irritation in the surrounding skin, be careful to apply the ointment only within the affected area. Treatment of burns and skin ulcers by breaking up and removing dead skin and tissue may rarely increase the risk for serious infection (sepsis). Tell your doctor right away if you notice any symptoms of serious infection, including: fever/chills, fast breathing (hyperventilation), fast heartbeat, warm skin, weakness. 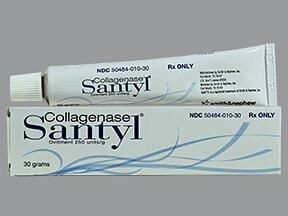 List Santyl Ointment side effects by likelihood and severity. Avoid using solutions that contain acid or metal as soaking liquids because these will decrease the effect of collagenase ointment (see also Drug Interactions section). What should I know regarding pregnancy, nursing and administering Santyl Ointment to children or the elderly? Before using this medication, tell your doctor or pharmacist of all prescription and nonprescription/herbal products you may use, especially of: antiseptic skin products (especially those containing heavy metals such as lead, mercury, silver). Skin products containing heavy metals may decrease the effect of collagenase. If the affected area has been exposed to one of these products, wash the area well with normal saline solution before applying this ointment. Store at room temperature at or below 77 degrees F (25 degrees C) away from light and moisture. Do not freeze. Do not store in the bathroom. Keep all medicines away from children and pets. Are you taking Santyl Ointment? 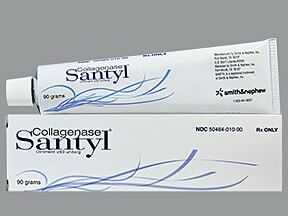 Are you considering switching to Santyl Ointment? How long have you been taking Santyl Ointment?